When kids know their way around a kitchen and can name a list of fresh vegetables and fruits they are more likely to choose a balanced diet. Not only does it keep them healthy in the long run, lets them share the healthy information with their friends, but they also grow up to be more confident cooks as adults. From stirring the soup to slicing the peppers with plastic or real knives, there are cooking and cleaning tasks that can be done at approximate age and skill levels. These are great ways to grow their independence! I know that cooking with toddlers is messy work, but remember: every spill contributes to a lifelong skill. Kids this age are pros at washing fruits and veggies. Fill the sink and put their splashing talents to good use. Younger toddlers can tear lettuce for salads and help with greasing baking pans. With adult assistance (putting our OCD aside! ), toddlers can also count and pour pre-measured ingredients into bowls and stir them together. > Super sharp tip: Keep your kids away from the cutting board while you chop with a distractingly fun task: emulsifying salad dressing. Pour ingredients into an unbreakable container, seal it tightly, then put on their favorite sing-along tune and tell them to get shaking! In my kitchen we are always dancing to Meghan Trainor’s song, “Better When I’m Dancin’!” Try it! You can’t help but move. With careful instruction and supervision, chopping vegetables, grating cheese and cutting herbs with scissors are all a GO! Older toddlers can cut soft ingredients, like strawberries, with a strong plastic knife. Measuring, stirring and setting and clearing the table are other age-appropriate tasks as well as helpful to us adults (usually). > Super sharp tip: Let your kids in on the big decisions by allowing them to choose one fruit and one veggie for your meal whenever you go grocery shopping. Taste buds change often as they grow so try something new every week. Kids in this age range can read, plan and execute a recipe – or even an entire meal. Working alongside, you’ll be able to play sous chef and still be able to supervise as they peel, chop and operate kitchen machinery like the blender, food processor, stove, oven, microwave and toaster. This is a great opportunity to share practical cooking and safety tips like how to protect their fingers while chopping or use the oven without getting burned, etc. > Super sharp tip: Let your child plan the menu. Writing grocery lists, budgeting and shopping for ingredients are so empowering your kids won’t even notice all the math skills they’re using. Tweens and teens can still benefit from your wisdom; be available for consultation, but try to allow them as much independence as possible. Read up together on safe food-handling techniques, proper cooking temperatures and other higher-level kitchen skills. Budding chefs may want the challenge of trickier dishes like making risotto or fresh bread or even ice cream. These are great ways to show how science and math are so very important in their school years. > Super sharp tip: Enroll in a cooking class together and you and your teen can sharpen your knife skills, learn new presentation techniques and expand your creative boundaries. Come out to our Kitchens! 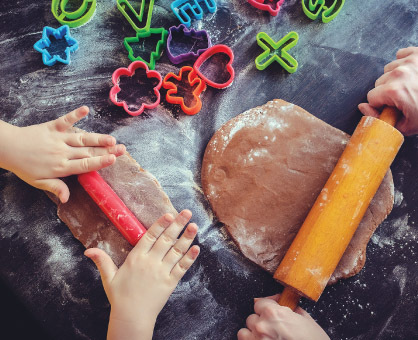 Our monthly classes and events at the School of Cooking offer fun opportunities including Parent and Child Classes, Jr Chef Classes and Camps, or private events including Birthdays, Girl Scouts, and Teambuilding. Visit our website for class schedules for our locations at Granger-Heritage Square, Warsaw and Stevensville. Our beautiful new Community Kitchens in our Concord and Western & Mayflower stores offer community classes and events, as well as the opportunity to reserve space for your next meeting, shower or birthday!